Swizzlers are stressed out wafer rolls from Mintley Meadow. Panic ensues when strangers get near these towering treats. 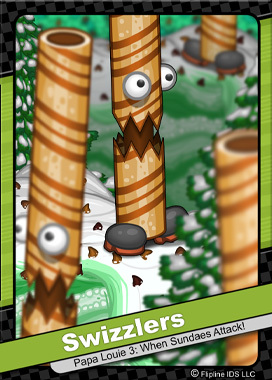 As Swizzlers frantically pace back and forth, you may find yourself quickly cornered in tight spaces. Despite their high center of gravity, Swizzlers cannot be toppled from simple side attacks. Only a conk on top of their hazelnut-filled heads can calm the situation.